It's my younger son's birthday at the weekend, I won't see him but my husband is going to visit today to help him move into a new flat and taking the cake with him. Because I had to make it a little early I chose a recipe which is made with oil and has good keeping qualities. It's also a brilliant cake if you don't have an electric mixer because it's easy to make with just a wooden spoon. 1. Heat the oven to 160C, grease and line two 20cm sandwich tins. 2. Sieve the flour, cocoa, bicarb, baking powder and caster sugar into a large bowl. 3. Add the syrup, beaten eggs, oil and milk. 4. Beat well and pour into the tins. 5. Bake for 25-30 minutes or until firm to the touch. 6. Turn onto a wire rack, remove the paper and leave to cool. 1. Put the cocoa, hot water and butter in a bowl and beat until smooth. Happy birthday to your son! Sorry you don't get to go and see him, though. I haven't seen sponge done that way before - with the syrup and oil - but I can see how it would keep lovely and moist and it looks absolutely delicious! Is it wrong I really want to eat this now? At just gone 9am? how could he not love his mum... adorable cake! 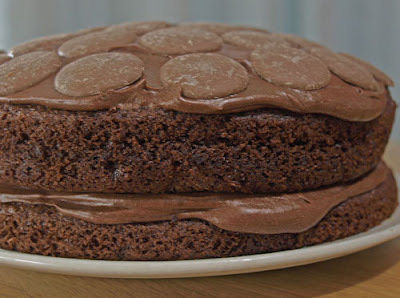 This reminds me of my mum's chocolate cake - She always used to put chocolate buttons or smarties on chocolate cake when we were younger! This is just my sort of cake. I love buttons and the sponge looks very good. I also agree on the tip about using oil, works wonders! Ha ha, I make all of my cakes with just a wooden spoon - or nearly all anyway! Your cake looks lovely and I bet it will be appreciated by the birthday boy. Lucky son! Sad you did not get to see him though but a new flat how exciting! 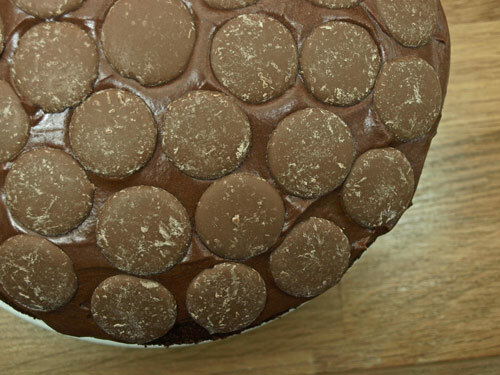 Love the way the icing is oozing out just makes you want to lick it! Yummy yum yum. Cake and Chocolate = Chocolate Cake which makes for a perfect birthday cake in my books. Hope your son enjoys it and his new flat, what a shame you won't get to share a slice with him. ahhh... your son is lucky! I love the buttons on the cake, so gorgeous and I surely love chocolate too! Looks great - what a lucky boy! And what is it with chocolate buttons - just so addictive! Ooh how lovely! 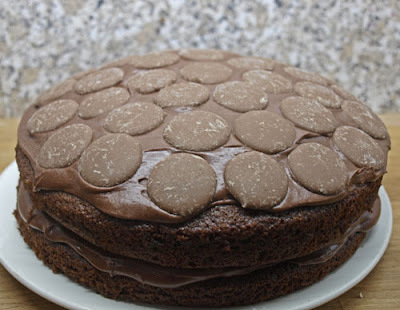 Love chocolate buttons and this looks soooo yummy! Oh dear I don't think could trust myself with an open bag of giant buttons! The cake looks delicious, really dark and chocolatley! I want some! That loos delicious!